Have you ever tried locating star formations at night? Are you intrigued about the planets, galaxies, or the milky way? The opportunity for you to learn more and get some fascinating views of the stars in our community will be available to you right in our own backyard! 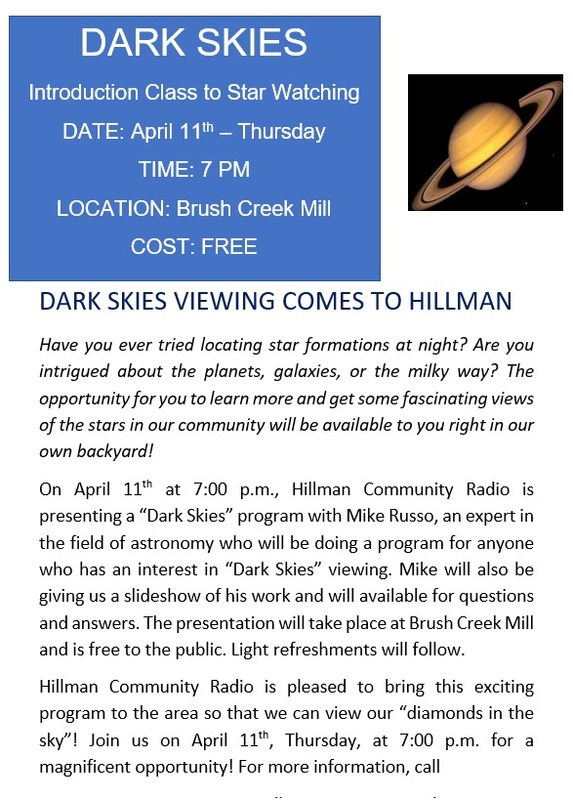 On April 11th at 7:00 p.m., Hillman Community Radio is presenting a “Dark Skies” program with Mike Russo, an expert in the field of astronomy who will be doing a program for anyone who has an interest in “Dark Skies” viewing. Mike will also be giving us a slideshow of his work and will available for questions and answers. The presentation will take place at Brush Creek Mill and is free to the public. Light refreshments will follow.